Learn more about drainage and water distribution systems. The course Understanding Drainage and Water Distribution Systems is designed for anyone who wants to get a better understanding of the drain, waste, vent, and water distribution systems. 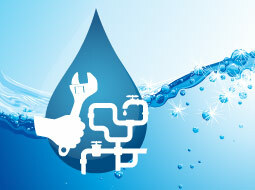 Within a building, these systems are installed and maintained by plumbers. A thorough understanding of how they work is, therefore, a crucial requirement of a plumber's job. This free online course - the fourth and the last in the series of plumbing courses – completes the list of introductory courses on plumbing. The first section of this course covers the major components of a drainage system. It also explains the basic drainage fittings and traps that are used by plumbers. The second section of the course discusses the water distribution systems. From outlining the water supply sources for private and municipal systems to explaining the water purification process, this section introduces the learner to how water is sourced and supplied to the public. This course will be of great interest to all professionals who want to understand how drainage and water distribution systems work. It will also be of interest to all learners who have completed the previous courses on plumbing, and would like to complete the series in order to gain a comprehensive understanding of a modern-day plumber's job. Having completed this course the learner will be able to: - Describe what is meant by a DWV system; - List the major components of a drainage system; - State the various types of DWV fittings used by plumbers; - Summarize the drainage waste disposal methods employed by private and municipal systems; - Discuss the health issues related to the improper installation and maintenance of DWV systems; - Outline the water purification process in water treatment plants; - Explain how water is sourced and distributed in private and public water supply systems.